← When the Barque of Peter is Tossed by Storms… Pray to St Michael Archangel! 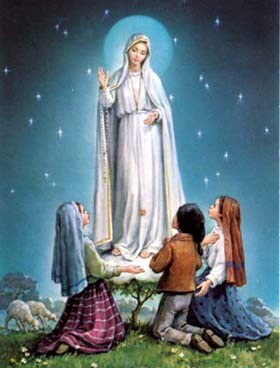 For the sake of souls living in an age permeated by the modernist heresy, it is not by chance that, at Fatima, Heaven highlighted the Church’s doctrines and dogmas so frequently undermined. Perhaps foremost among these ignored truths is Purgatory, a dogma pertaining to the interior life of the soul and the mercy and the justice of God. The word purgatory comes from the Latin purgare, which means “to purify” or “to cleanse.” “The word Purgatory is sometimes taken to mean a place, sometimes as an intermediate state between Hell and Heaven,” explains Fr. Schouppe, S.J., author of Purgatory – Explained by the Lives and the Legends of the Saints. We may think otherwise, but sanctity is not impossible, for Jesus Himself encourages and instructs us, “Be you therefore perfect, as also your Heavenly Father is perfect.” [Matt. 5:48] Neither can we reach spiritual perfection by our own efforts, but “with God, all things are possible.” [Matt 19: 26] For the living, each day of earthly life is “a time of trial, a time of merit for the soul” and at the very moment life ends, the immortal soul remains in the state in which death claimed it. While we hope that our merits will gain us heaven, we must also remember that what we deem as only trivial faults are not small in God’s eyes. In considering Purgatory, our frail human nature frequently tends to think only of God’s mercy, simultaneously preferring to forget His Justice. Regardless of our personal opinions, God has revealed that His two attributes of Mercy and Justice are never separated. Like the slightest shadow which must disappear before the sun’s bright light, “no shadow of sin can endure before His Face.” Souls who depart this life in a state of sanctifying grace are saved and will attain Heaven, but if there is any debt still remaining for absolved sins – any slight lack of perfect charity in love for God or neighbor – then God’s Mercy and Justice allows the saved soul to expiate its sins in Purgatory. In recent times, Our Lady Herself referred to Purgatory when, at the first Fatima apparition in May 1917, She was asked by the child Lucia about the souls of two young village ladies who had recently died. What did Amelia do? That is, what forgiven sin(s) committed by a young person (a “teenager” by today’s standards), who lived in a remote village without any modern conveniences or amusements, could lead to a Purgatory of such time and duration? “Just” one mortal sin! Was Lucia’s response a delicate hint that it was one mortal sin, obviously repented, for which Amelia would endure a Purgatory incomprehensible to our minds? Did Our Lady make this known to Lucia? If such is the case, it still remains that we do not know the details of Amelia’s solitary mortal sin – but neither do we need to know. Instead, we should consider the reasons why Our Lady allowed to be made public the state of two souls, one who was already in Heaven (a revelation which many overlook) and one who would be in Purgatory until the end of time. Frère Michel also wisely notes that we may rarely think about Maria das Nevas, the young soul of whom Our Lady said so simply, “She is in heaven.” No, we are not inclined to ponder much about Maria, for today we are misled to believe that Heaven is our natural “right.” Perhaps, too, we make light-hearted jokes like, “Well, at least in Purgatory, I’ll be with friends.” Yet the sufferings of Purgatory are not objects of jest, especially because the straight and sure path to Heaven is made known to us: Pick up your cross daily and follow Me. Should we not first contemplate the teenaged Maria, if only for a few moments, and wonder: How did she fulfill God’s Commandments? What heroic virtues did she practice? Did she endure Purgatory at all – or was her soul taken straight to Heaven? Were inquiries ever made about the details of her life or death? Is there anything really known about this young lady, other than her name and age? Or was her hidden and humble interior life – in which (as it seems) no one showed interest, even when her glorious state in Heaven became known – meant as a lesson in itself? We call these souls “poor” because they can do nothing for themselves, relying always on our charity offered on their behalf; we call them “holy” because there is no question that they are among the saved. Cherished by God and assured of their salvation, they can and do intercede for us with their prayers. However, while the poor souls can pray for us but no longer gain merit for themselves, and since the saints in Heaven pray for them but cannot acquire any indulgences for them, those who languish in Purgatory rely on the charity of the living. This is the beautiful “secret” regarding Purgatory, as St. John Chrysostom reminds us, “Not by weeping, but by prayer and almsgiving are the dead relieved.”  It is only we, the Church Militant, who can obtain many indulgences (plenary and partial) for the faithful departed. 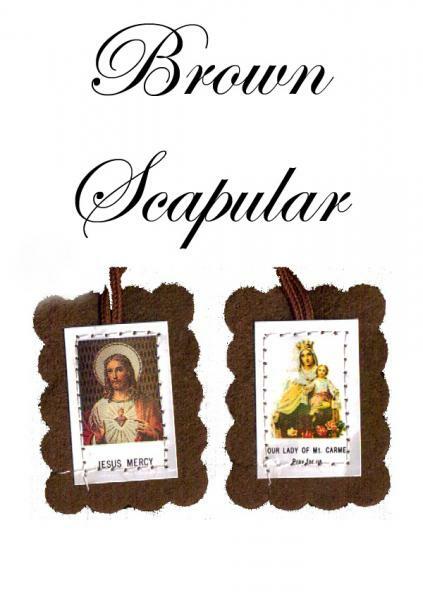 The Brown Scapular of Mt. 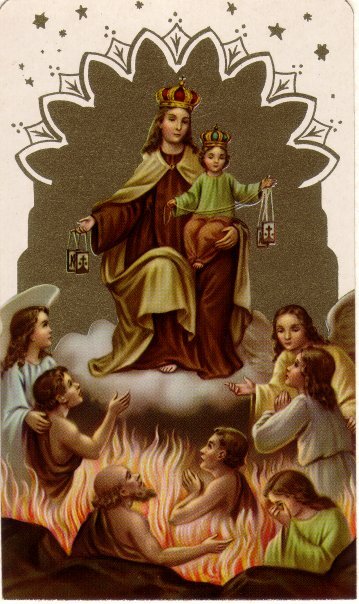 Carmel: To those who wear this Scapular with devotion, Our Lady promises, “Whosoever dies wearing this Scapular shall not suffer eternal fire.” Too, a pious kiss given to the Brown Scapular offers 500 days’ indulgence, which we can offer for the Poor Souls.